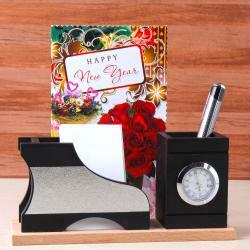 Product Consists : New Year Greeting Card, Wooden Pen and Paper holder with matching Table Clock along with 2 Designer Roller Pen. 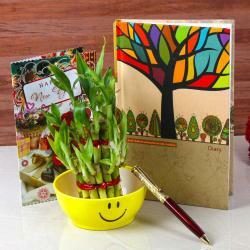 Your loved ones will feel elated to receive this fascinating gift from you on New Year. 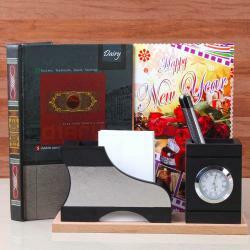 This hamper includes unique gift Items like wooden pen and paper holder comes with matching table clock along with the finest pair of ball pen. This hamper also includes the greeting card for wish your recipient a very happy and prosperous New Year. 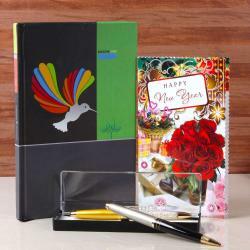 Such thoughtful and impressive gifts are perfect to make New Year celebration of your dear ones a memorable affair. So, why are you waiting for book your order now? Product Includes: New Year Greeting Card, Wooden Stand of Pen and Paper Holder with Matching Table Clock along with 2 Designer Roller Pen.